Join us in welcoming one of our newest contributors, Shelby Turner, to For The Family. 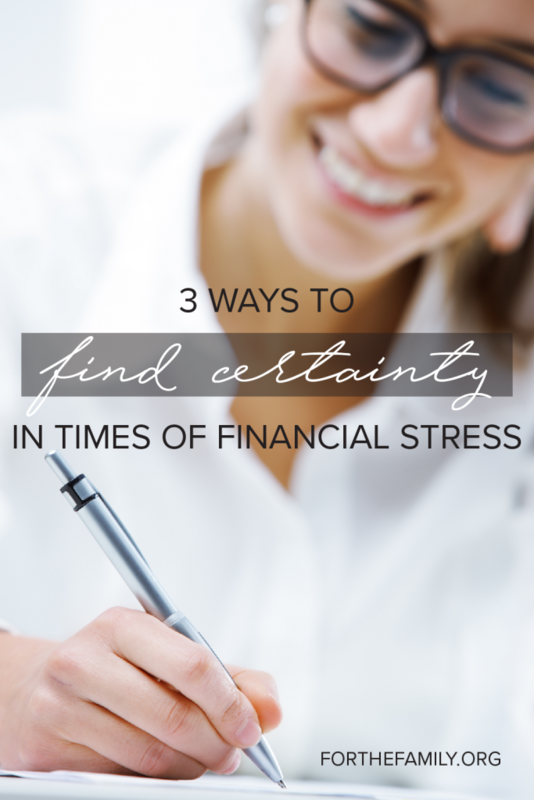 Today Shelby shares encouragement for finding security in God when walking through financial chaos. One year ago today my husband suddenly and unexpectedly lost his job. What he thought would be just another day at work turned into a box packed with his personal belongings, a good luck handshake from his now former boss and a difficult phone call to his wife. His job loss rocked our world. We had two small children and a third was due to arrive in a matter of weeks. We had only a month earlier signed the paperwork to buy a fixer upper house that was halfway through an extensive and costly renovation. And to top it all off it was December 9, only 16 days before Christmas. We knew without his income we couldn’t afford many gifts for our two young boys. Everything felt uncertain and the truth was.. it was uncertain. As we walked through the financial ups and downs of that season, God helped us find security and stability in him. Choose to work together. In times of stress the very worst parts of me surface in my relationship with my husband. I pull away. I unfairly place blame on him. I let my anger fester and grow. I choose self sufficiency over togetherness and attempt to fix it all alone. But the truth is that I am not alone. I have a husband and children and God built families this way because we find strength to face difficulties in togetherness, not self sufficiency.I have learned that I need to make an effort, daily, to approach our difficult circumstances together with my husband. This means we pray together, strategize together, and hope together. We have honest conversations about our fears and concerns. We fiercely support and encourage one another. And we found that although it wasn’t easy, our marriage could thrive even in the midst of financial stress. Choose to see the bigger picture. Instead of focusing on how our plans for the future were crumbling, we chose to adjust our focus. We chose to believe that God is good, trustworthy and in control of our situation. We couldn’t see what God was doing at the time, but we can clearly see it now. Our momentary financial struggles have turned into a beautiful display of God’s goodness and provision.Anytime someone comments on our beautifully renovated home, we get to tell the story of how this house was purchased not by our own strength, but by God’s miraculous provision. Our home could have just been a nice place to raise our family, but God in his sovereignty has turned it into a shining beacon that points straight back to him. And honestly, we wouldn’t have it any other way. Choose to find your security in God’s resources, not yours. Your God is not poor. He doesn’t lack for resources or money. And according to his word, he will use his resources to care for those who love him. He will never leave his children begging for bread. God has all you need and he chooses when and how to provide for you. Every time the mounting bills seemed overwhelming, I would lift my fearful heart out of the place of doubt and hold it before God saying, “God, you have all we need. Would you provide for us again this month.” Although our bank account was small, I knew my God had more than enough and would provide. In our story, God provided what we needed while my husband was out of work in many miraculous ways. There were odd jobs to help pay the bills, a generous church family who helped us prepare for a new baby and a sign on bonus at his new job that couldn’t have been more perfectly timed. It was always tight, but we were never lacking. We are thankful for the way God shaped our hearts in that time. He taught us that he alone is our provider and we still lean on that lesson when other unexpected financial upsets hit. If you are currently in a financial hardship there is a firm foundation for you. God has all that you need.